Warning: This post contains descriptions of historic practices of human sacrifice and cannibalism which may be disturbing to some readers. 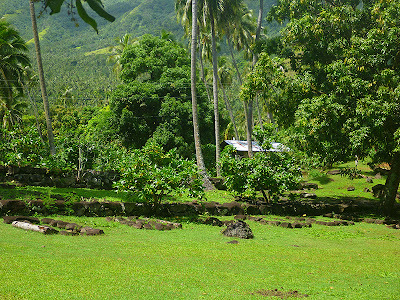 I gave an account of walking over the mountain from Anaho Bay to the village of Hatiheu in the previous post. 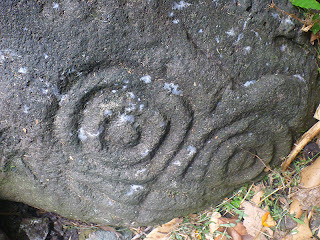 Our intention was to visit some of the archaeological sites in the valley. 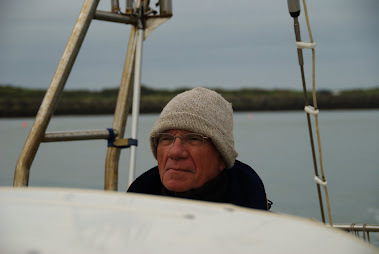 Although they were within walking distance, and given a few directions we could have visited them on our own, we were hoping to find a local guide to give us more insight into what we were seeing. Hatiheu is linked to the rest of the island by road, and we knew tour groups from Taiohae routinely came to see the ruins. We didn’t know if we could hook up with one of these tours in Hatiheu or find a separate tour. 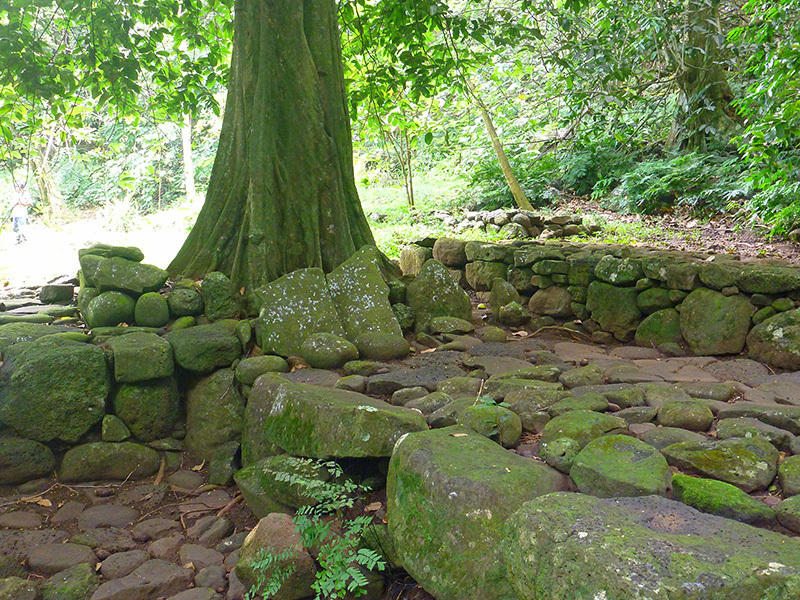 Hiohka took us to two archaeological sites within walking distance of the village: tohua Hikokua and tohua Kamuihei, both gathering grounds containing meae, or platforms where human sacrifice was performed. 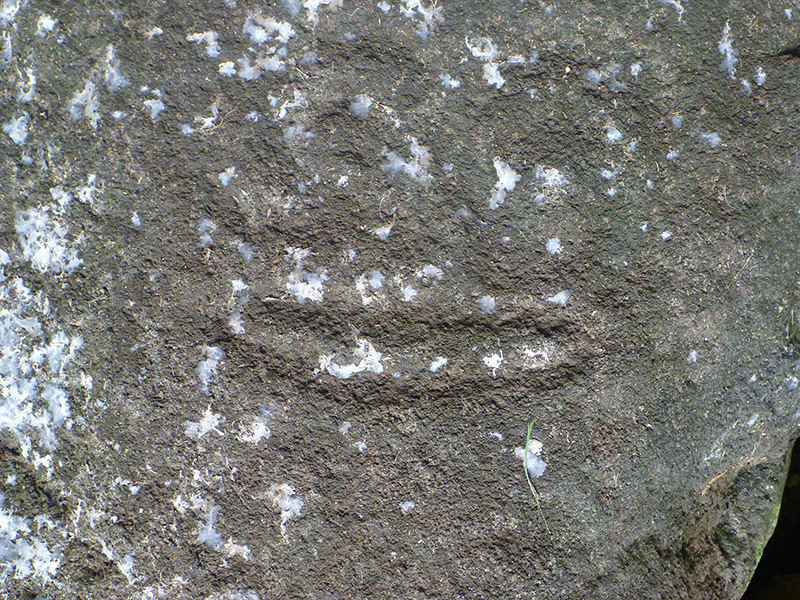 He told us there were actually five or six archaeological sites in the valley. 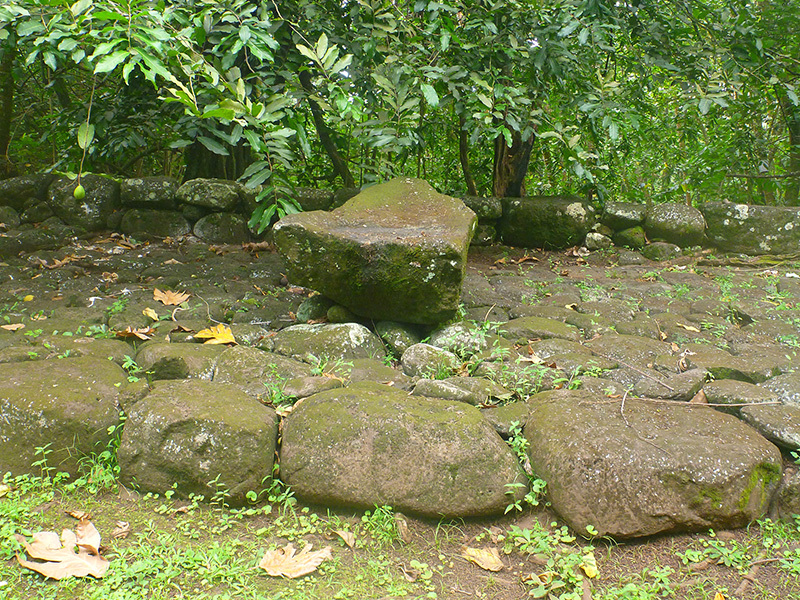 We learned that the same platforms were often used for both human sacrifice and dancing, indicating the highly ritualized nature of human sacrifice in ancient Marquesan culture. Hiohka related to me a legend about how the haka dance was born. Haka is a Polynesian dance form practiced in the Marquesas that is similar to hulu in Hawaii. Keep in mind that this legend was told to someone (me) with very little Marquesan/French language skills by someone with very little English language skill. But as I understood it, the legend went something like this: A son was born to a woman from Hiva Oa and a man from Hatiheu (on Nuku Hiva.) The woman took her son to Hiva Oa and raised him there. 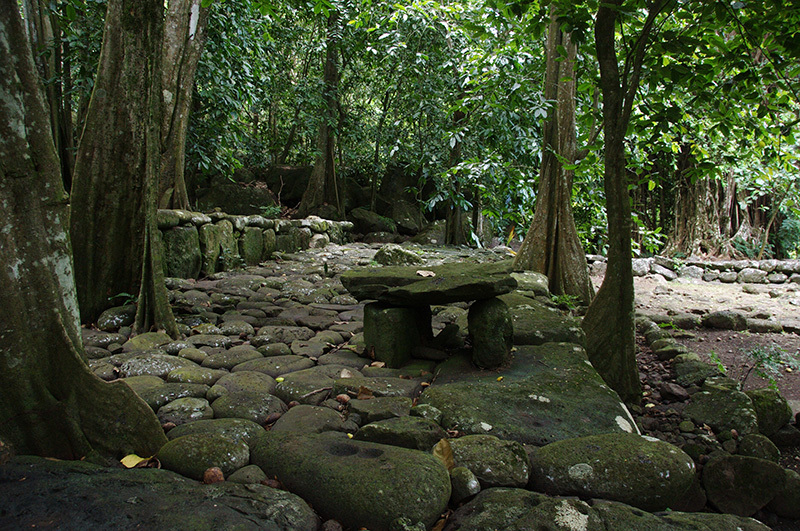 After a time, the son wanted to find his father, so they returned to Hatiheu. 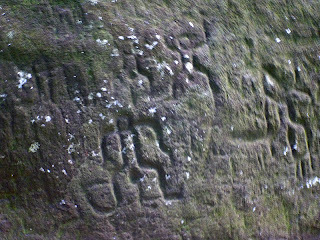 There, they were treated as outsiders and captured by the valley’s tribe. 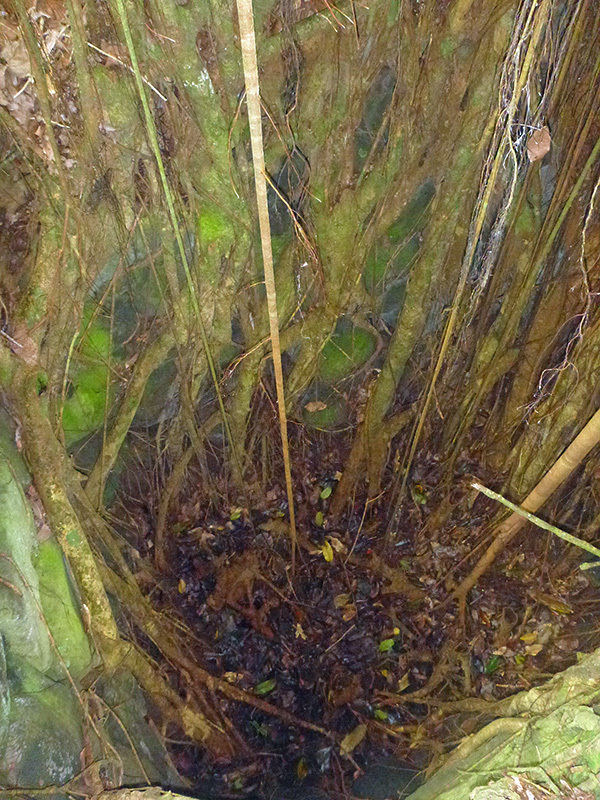 They were imprisoned in this pit (now collapsed), awaiting sacrifice. Around this time, the father also began thinking about his son and went to seek him out. He found his family held captive in the pit. Hiohka also told me that as a result of this legend, haka is performed by different genders on Hiva Oa and in Hatiehu (Nuku Hiva); however, I could not find any information to corroborate this. 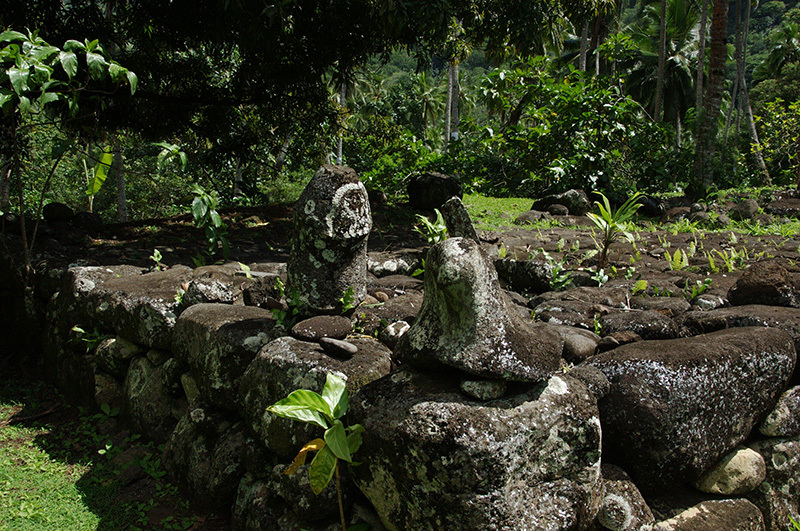 It may have once been true but does not appear to be true today, as members of both sexes participate in some form of haka dance on both islands. At Hikokua, we also saw this chilling sculpture of a chief holding an infant and a weapon. It is not clear to me if he is holding an ‘u’u---ancient club weapon used for combat---or one of the neck-breaking devices described later in this post. 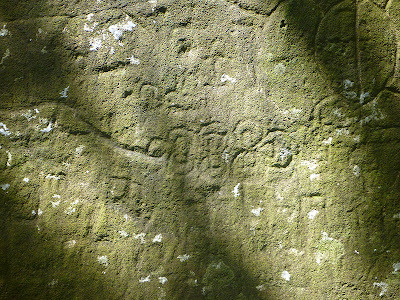 (Our guide said it was an 'u'u, but I have seen it recorded elsewhere as the latter.) 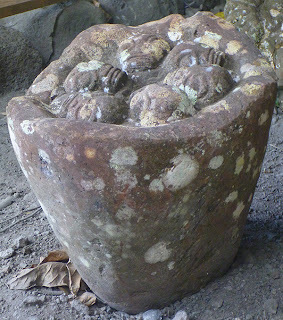 When I asked if it was typical to sacrifice babies, our guide responded that the chief in question was a “bad chief,” indicating a level of cruelty that was perhaps not typical. We moved on to Kamuihei. 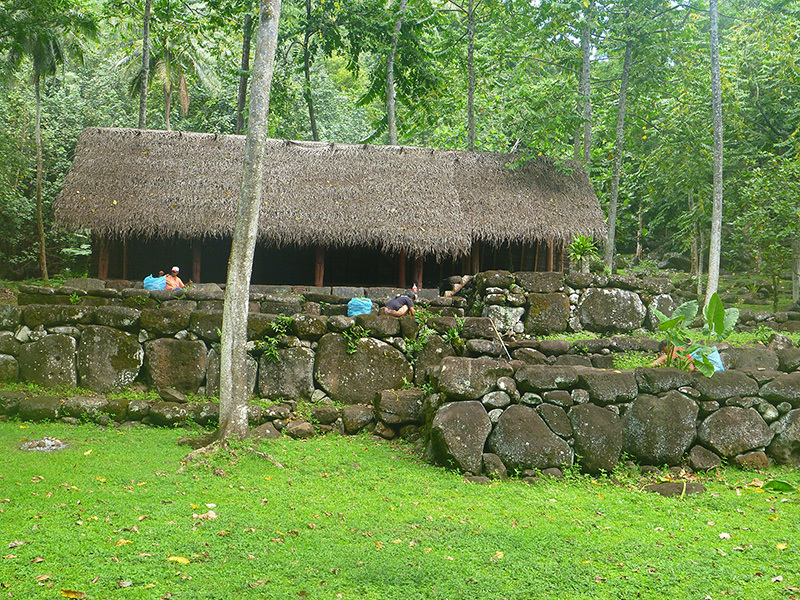 This site had been partially reconstructed when it hosted a Marquesan arts festival. 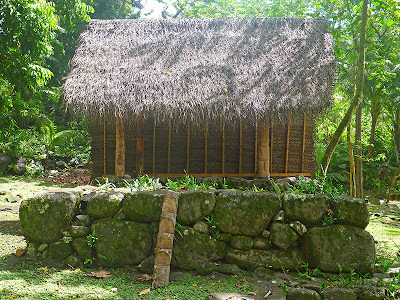 Here, we saw these reconstructed lean-to-type shelters of pandanus walls and roofs, which were used as sleeping platforms. 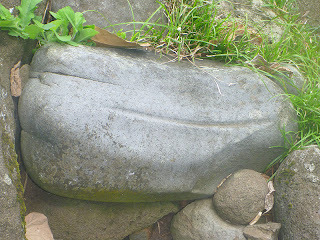 Some of the artwork on the site was not Marquesan, but had been created during the arts festival. For example, this basket of skulls (depicting the Marquesan custom of keeping the skulls of both enemies and ancestors) was created by an artist from Rapa Nui. 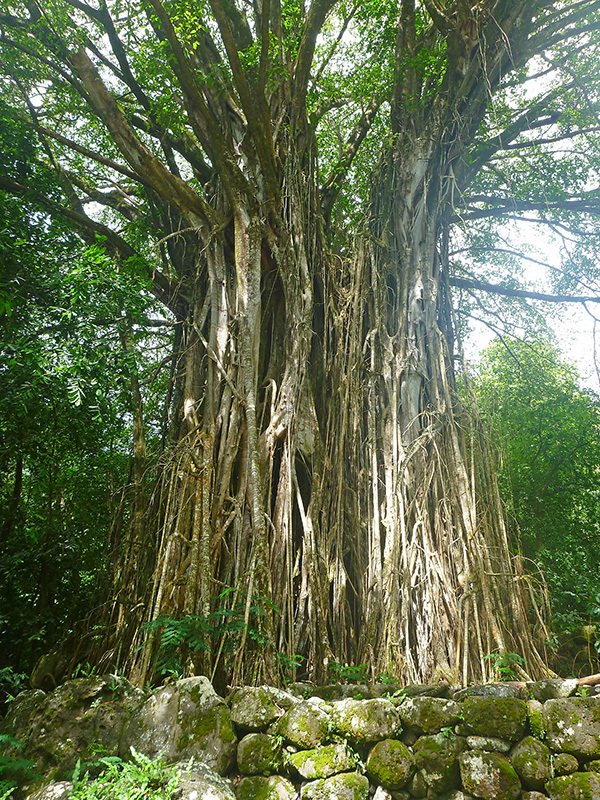 Dominating the site at Kamuihei was an ancient banyan tree, which our guide estimated to be seven-hundred years old. A picture does not do justice to the girth of the tree, which was almost 50 feet in diameter. 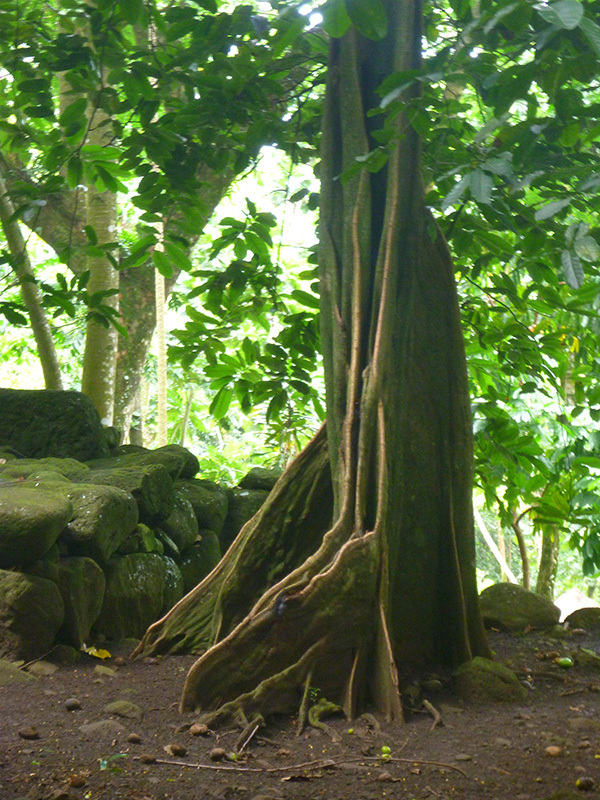 If trees could speak, this ancient tree would have a lot to say because it witnessed untold suffering. 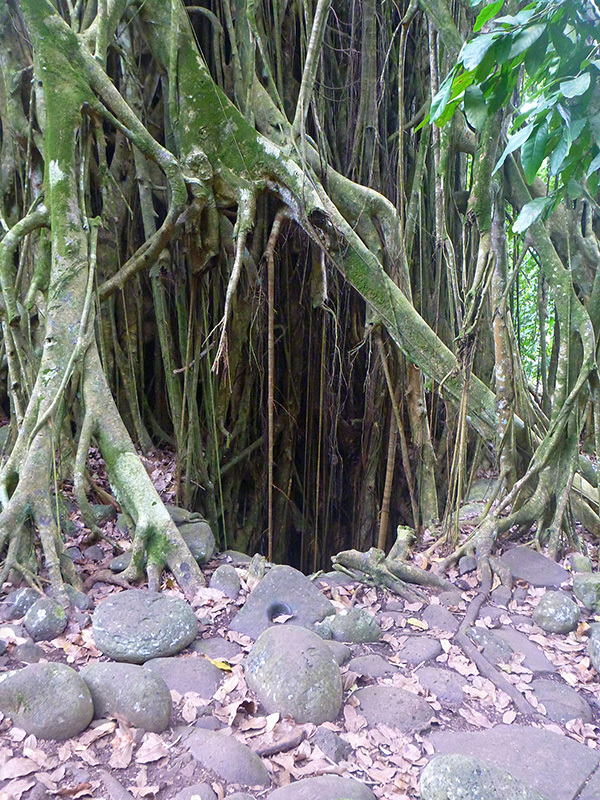 Here, at the edge of the banyan roots, was another pit in which people were imprisoned prior to being sacrificed. This pit was much deeper than the one at Hikokua. 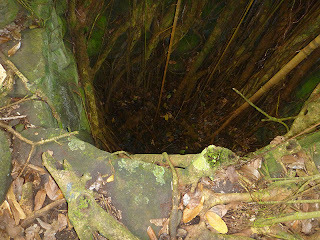 Our guide told us that the skulls of sacrificed victims were also thrown into the pit, and that the archaeological expedition that cleared the site recovered many skull caps from the pit. Imagine what it felt like to be a prisoner in that dark pit, about to be killed, cooked, and eaten, and seeing the skulls of former victims surrounding you: terrifying. Perhaps the ancient tree lives on so the stories of those victims are not lost. To keep things in perspective, however, I must relate the story our friend Henri told us when we returned to Taiohae and heard we visited Hatiheu. 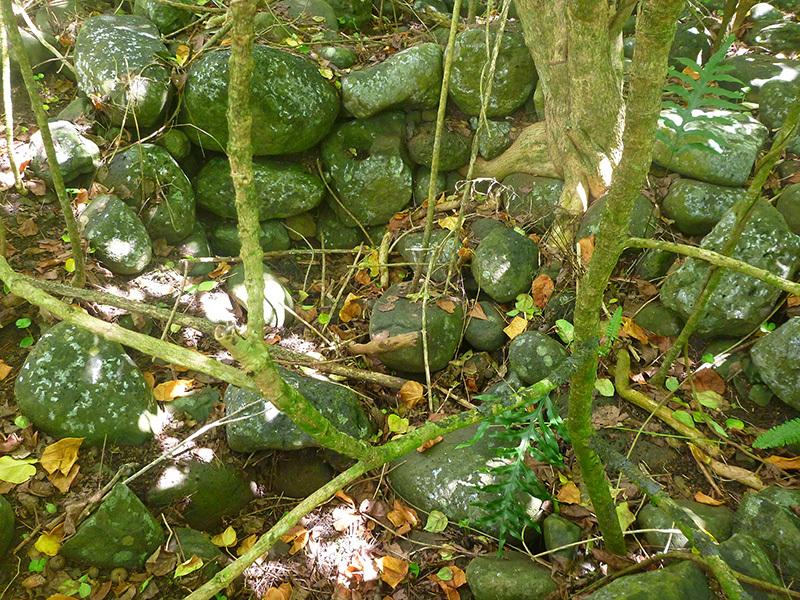 He said he could take us to a place where tens of thousands of skulls could be found, those of Marquesans whose bodies were burned in mass graves after they died from diseases brought to the islands by Europeans. In an earlier post (Initial Impressions of French Polynesia), I mentioned that the population of the Marquesans had declined from an estimated 20,000 to around 8,000. It turns out that original figure was a gross underestimate, and I have since corrected it. Estimates of the Marquesan population at the time of first European contact range from 60,000 to 80,000 (by the Europeans) to over 100,000 (by the Marquesans.) 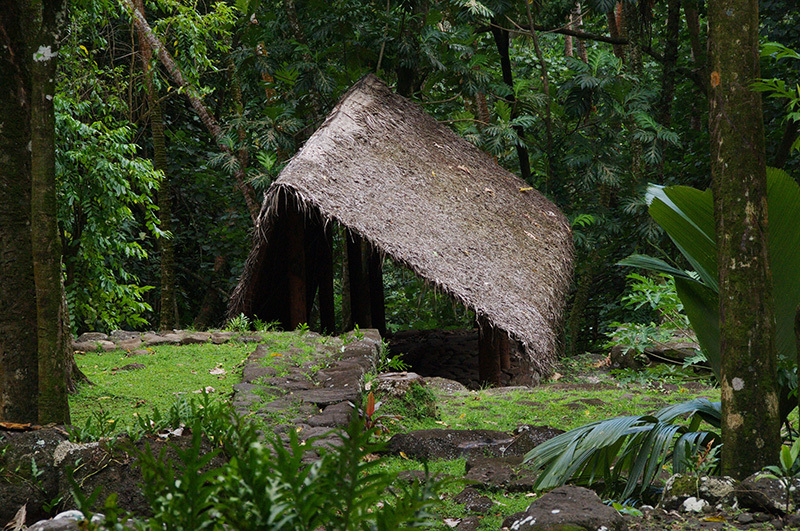 The old story, witnessed in the Americas, in which native tribes were decimated by diseases brought through European contact, played itself out in the Marquesas as well. 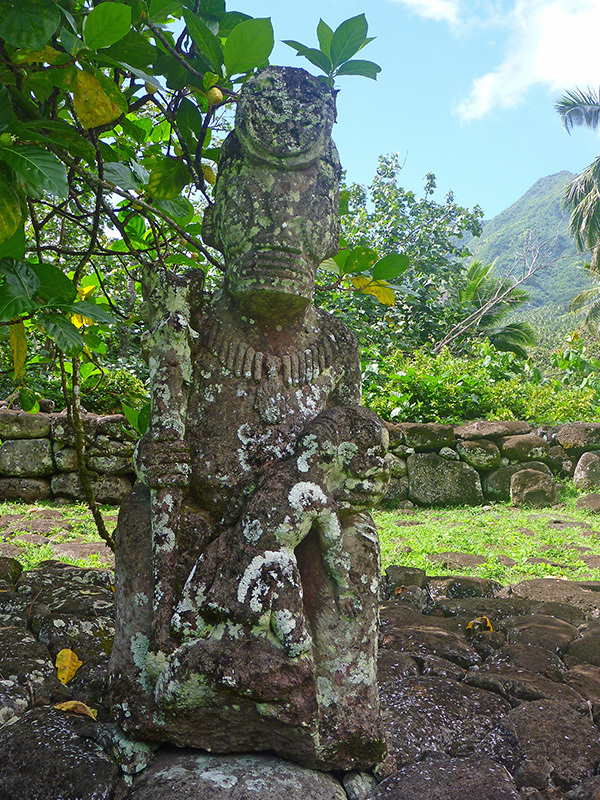 While their own practices of human sacrifice and cannibalism affected relatively few victims, the impact of European diseases on the Marquesans had a much larger impact. 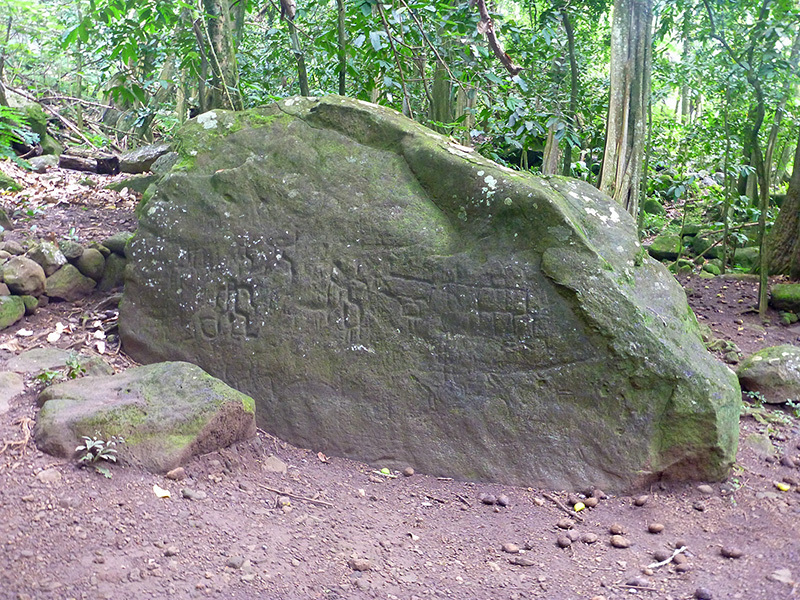 It is also important to note that Marquesans did not always practice human sacrifice and cannibalism. Their early history in the islands shows no evidence of this. 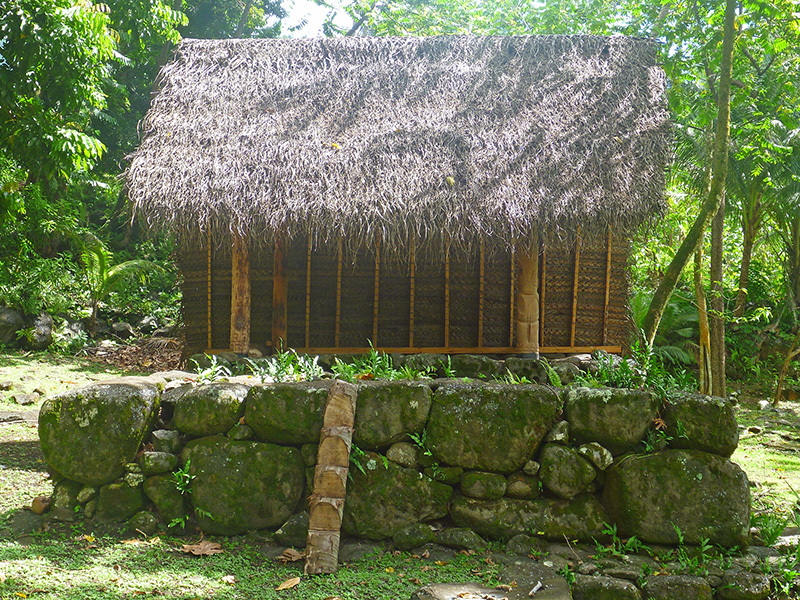 A poster outside the archaeological museum at Hatiheu indicated that the large-scale tohua and meae were constructed during the 1600's and 1700's---and although cannibalism persisted on some islands until the early 1900's, it no longer exists today. 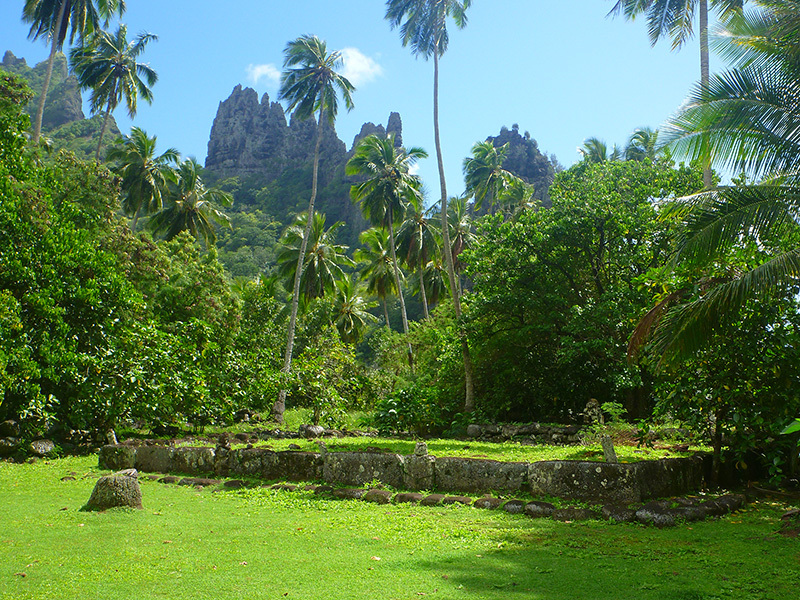 When you put that in perspective with the arrival of the Marquesans on these islands---between 100 AD and 300 AD (estimates also vary)--it is a relatively short time period. At Kamuihei, we gained an appreciation for the full scale of the archaeological sites and the activities held there. 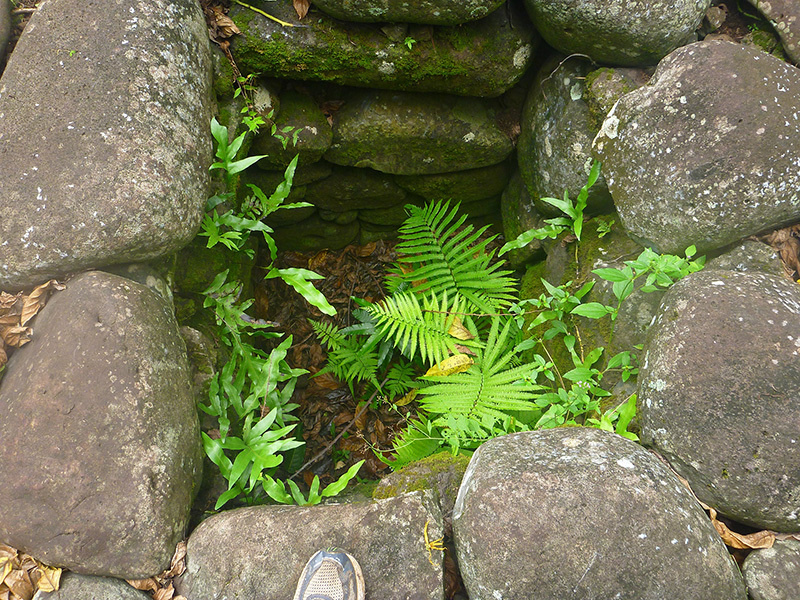 We did not even see the entire site, Hiohka told us it extended ever further back into the valley. 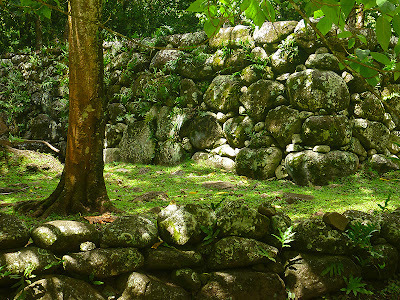 As we mentioned in the post on Puamau, the meae were constructed in levels, in a series of plaforms or terraces. 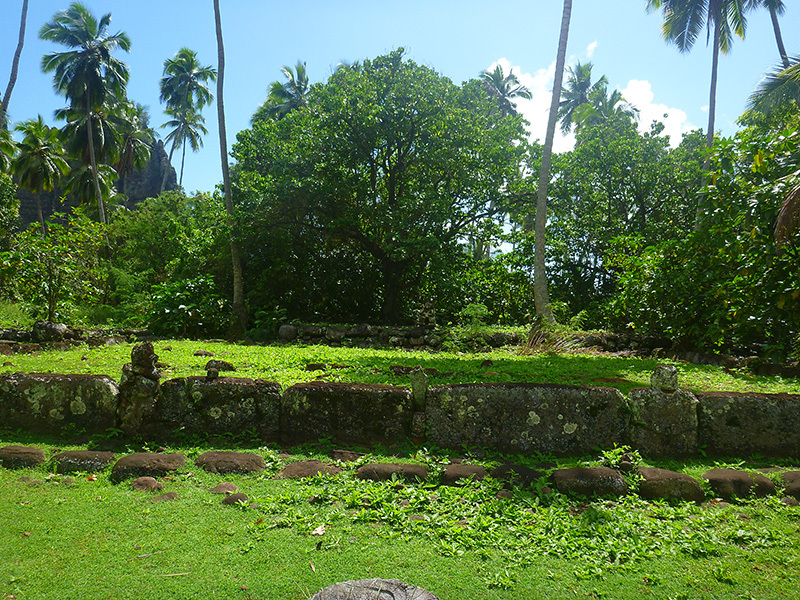 Only the priests had access to some levels, which were “tapu” (or taboo) to normal people. 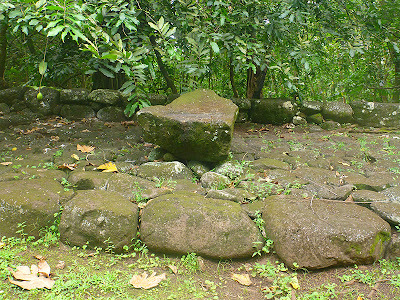 This higher platform was relegated only to chiefs, who would watch the spectacle of human sacrifice on the lower platform below. Here was an area of the site in which human sacrifice occurred. 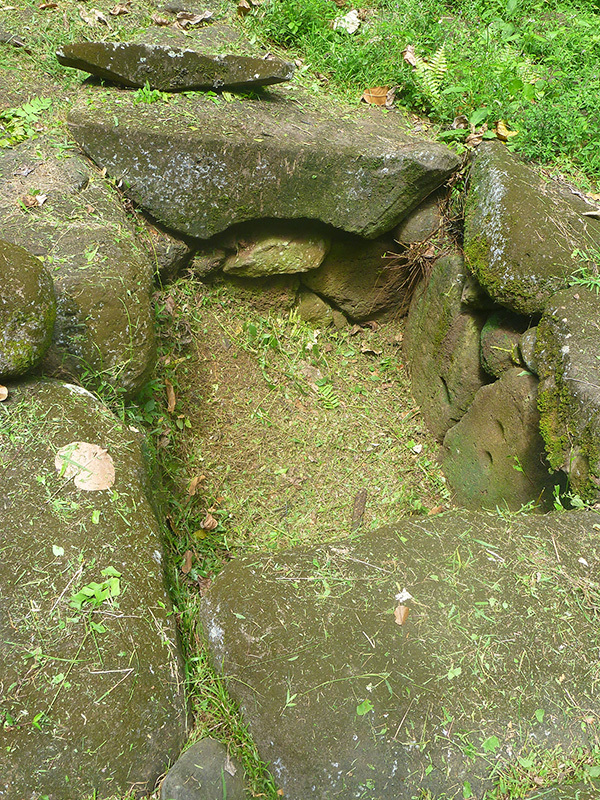 This level was directly below the level on which the chiefs were seated. Thousands of spectators gathered in the lower level. The site is surrounded by mape trees, and our guide demonstrated how the mape tree was used to gather the tribe (an alternative to blowing on a conch shell). 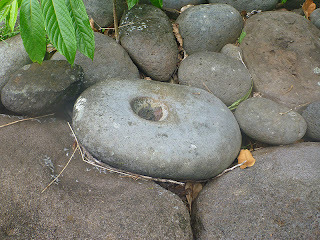 When a rock is pounded against the base of a mape tree, it results in a large, hollow bass tone. 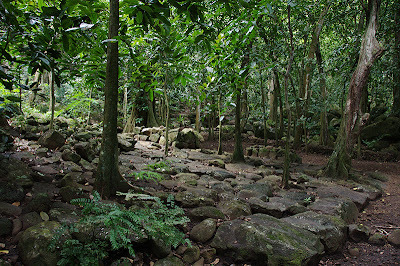 At large tohua, like Kamuihei, there are actually sub-sites within the site, so there may be more than one area where these activities take place. Thousands of people would gather to watch the spectacle. Patrick remarked that the level of cruelty involved in that reminded him of the Romans, who would gather to watch people being fed to the lions as if it was a sporting event. 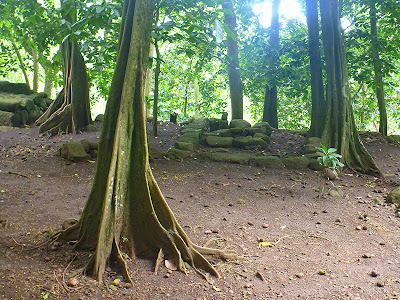 Our guide did not tell us about it, but we heard from others who had visited the site, that victims of human sacrifice were subjected to some level of torture before sacrifice. These victims were primarily enemies from rival tribes, and intertribal warfare was common in the Marquesas during the time period when cannibalism was practiced. If a victim was not already dead at the time of sacrifice, the head of the victim was cut off. At the Te Henua Enana museum, we saw a stone that the priest was said to place on the head of the intended victim. The stone was believed to absorb the enemy's power and mana (a sort of accumulated spiritual wealth, something like karma.) At the same museum, we also saw a tool that was said to be used to break the neck of a victim before sacrifice, so apparently more than one method was used to kill victims intended for sacrifice. I believe (but don’t know for sure) that human flesh was cooked in earth ovens like roasted pigs are today; in fact, the Marquesan term for human flesh was “long pig.” However, there were also shallow pits on the sites that may have been used for cooking other dishes or fermenting breadfruit. 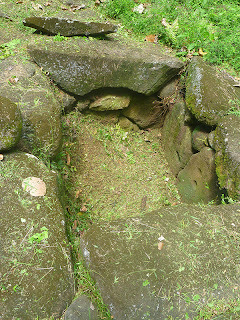 It was difficult to tell tombs, ovens, and areas used for cold storage (like our root cellars) from each other, and I think their location in the sites was one of the primary indicators of their use. Here is a sharpening stone that was present on the site. 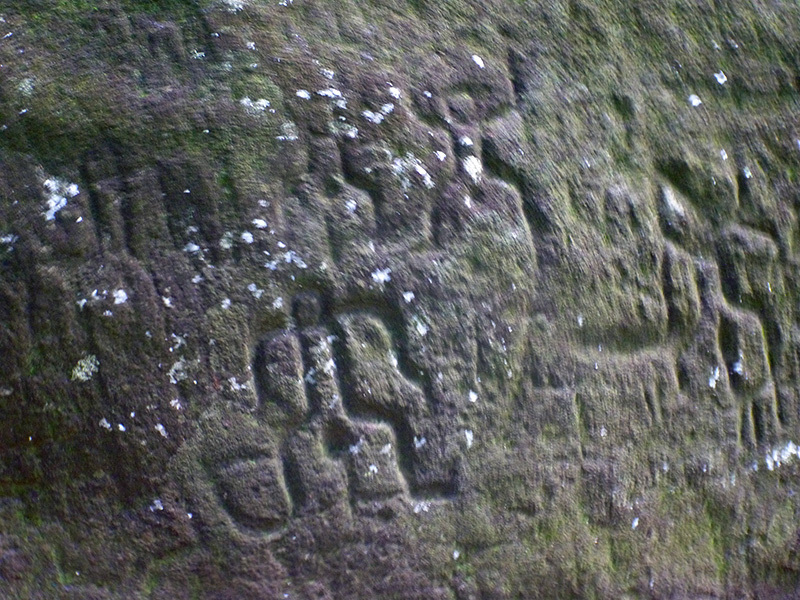 Along with human sacrifice, other rituals and ceremonies took place at the meae. 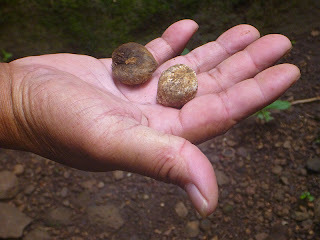 We were finally told that the purpose of the rock mortars we had been seeing everywhere was not just to hold tattoo ink but to grind medicinal compounds as well. Hiohka also showed us the Marquesan nut used to make tattoo ink. 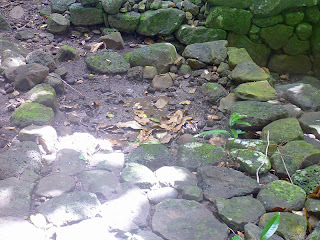 Here is a second site used for human sacrifice at Kamuihei. Here, the large rock was used to decapitate the victim. Again, the platform on which the rock rests was also used for ritualized dancing connected with the sacrifice. 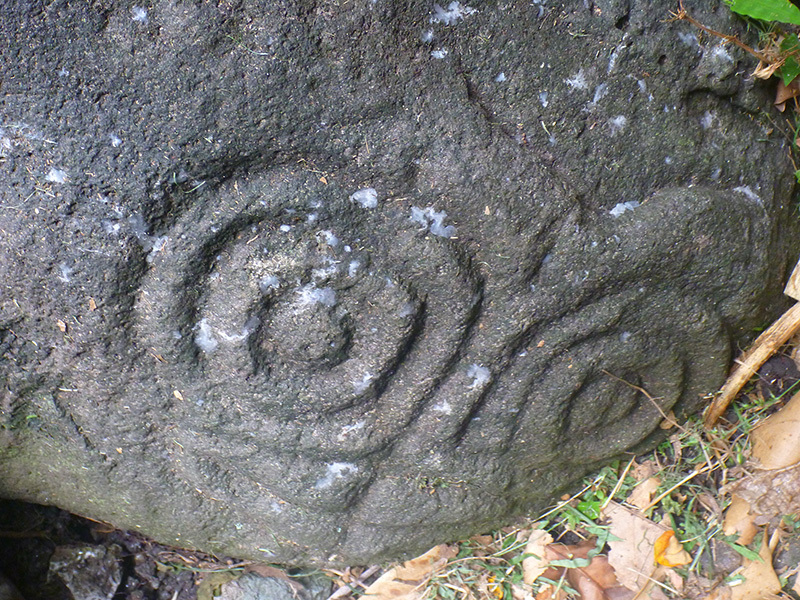 On a brighter note, there was also a rich legacy of petroglyphs preserved at Kamuihei. 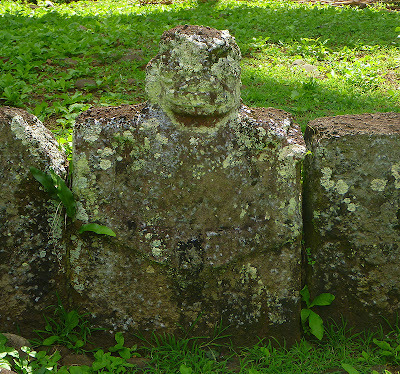 We learned that the wide-eyes we had first seen on Smiling Tiki were called matas. 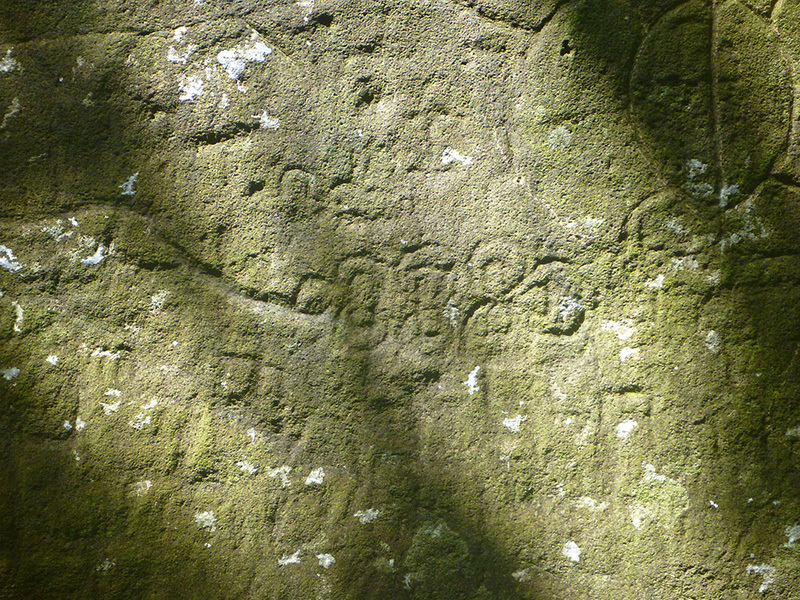 I had to take this picture upside down because the rocks on which the petroglyph was originally carved had been disturbed. 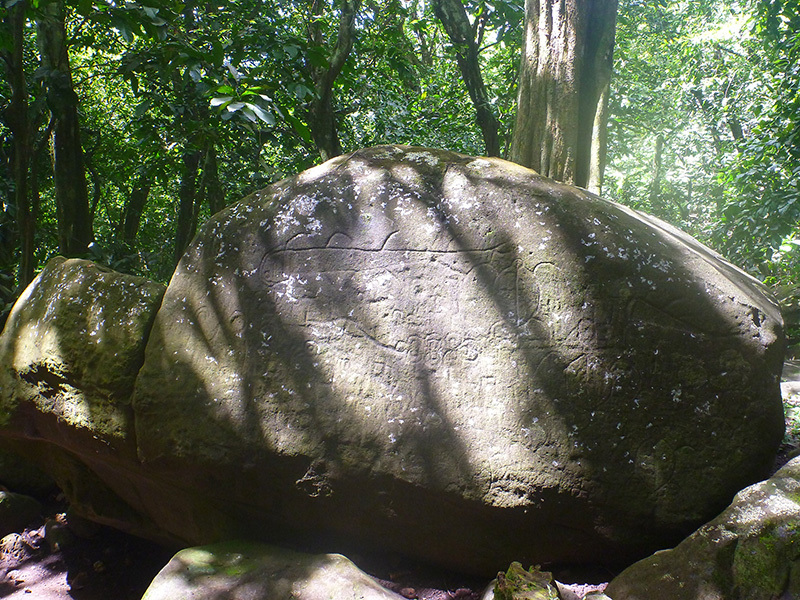 There were also some very large scale scenes carved on boulders. 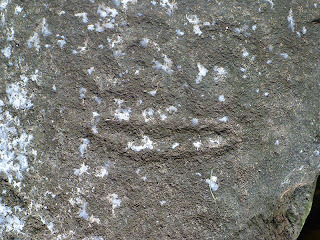 Here is a detail of the human figures from the above petroglyph. The dominant figure in the scene is the large fish or mahi mahi near the top. Here is a detail of an outrigger canoe or pirogue. 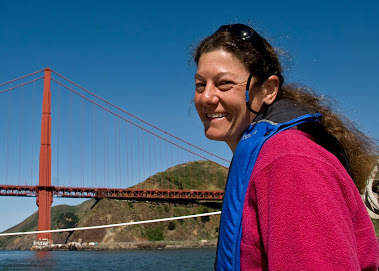 As we toured the two sites, I noticed Hiohka displaying stewardship. He picked up a piece of trash at the first site, a beer can probably left behind by local youth. 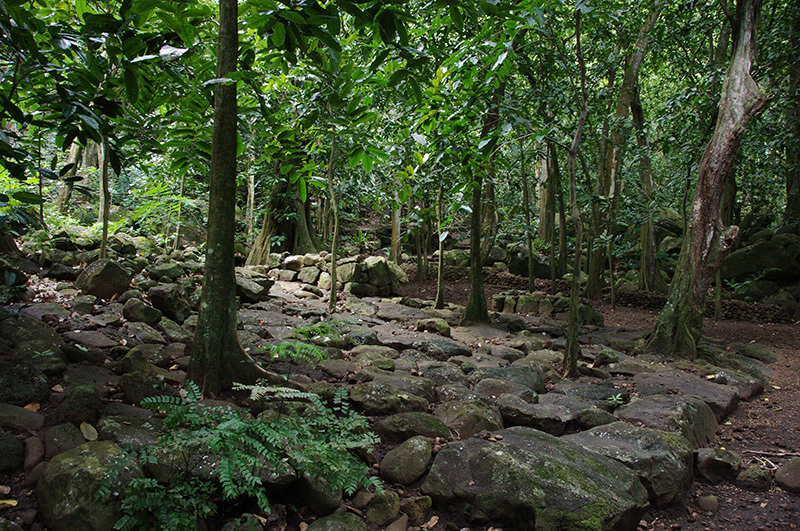 From time to time, he would also stop and pull up young saplings that had sprouted between the stones in the meae at Kamuihei. As we neared the end of our tour, we approached a platform where three women were working, weeding between the stones in the platform. Hiohka introduced one of the women to me as his sister. I got the impression that Hiohka’s family maintained this particular site. 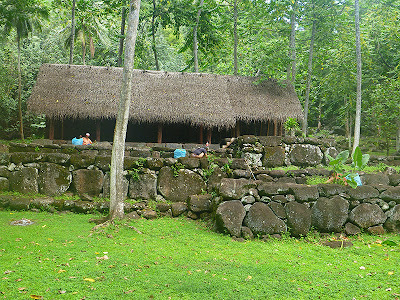 I don’t know for sure, but I inferred that maintaining their cultural legacy is a volunteer effort on the part of the Marquesans and that none of the French governmental budget is allocated for this. 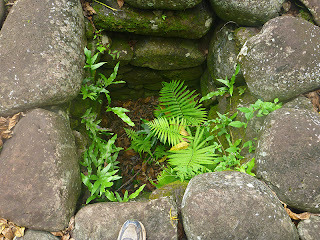 On the way back to the village, Hiohka indicated an area where there was an even larger site than the one at Kamuihei. He explained that the site used to be maintained by the school children, but since there are now fewer school aged youth in the village, it is no longer maintained and the jungle has grown back over it. Our visit to the archaeological sites in Hatiehu was both sobering and illuminating. Even with the language barrier, I was really happy we’d elected to go with a guide. We got much more out of the experience than we would have on our own. Great pictures you guys. A very good read, enjoyed another one your wonderful delightful adventures.